This shouldn't be about politics or fringe ideology. It should be about the responsibility of the government to provide complete, accurate and accessible health information that serves all Americans effectively, including our GLBT loved ones. HHS has removed basic health information on one site at the demands of an extremist group, and has completely omitted all content about GLBT youth on another. This is outrageous and unacceptable. 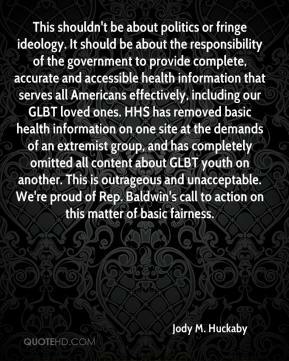 We're proud of Rep. Baldwin's call to action on this matter of basic fairness. 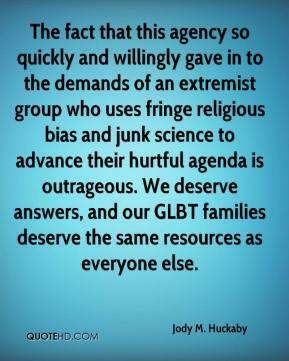 The fact that this agency so quickly and willingly gave in to the demands of an extremist group who uses fringe religious bias and junk science to advance their hurtful agenda is outrageous. We deserve answers, and our GLBT families deserve the same resources as everyone else. 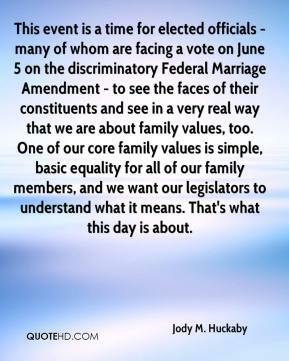 This event is a time for elected officials - many of whom are facing a vote on June 5 on the discriminatory Federal Marriage Amendment - to see the faces of their constituents and see in a very real way that we are about family values, too. One of our core family values is simple, basic equality for all of our family members, and we want our legislators to understand what it means. That's what this day is about.